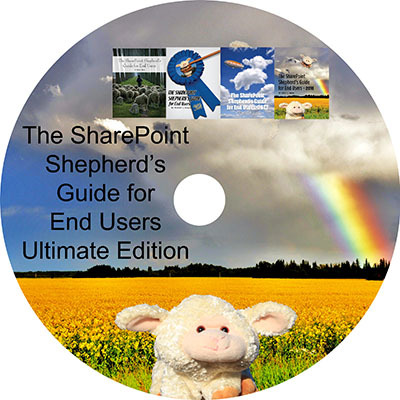 The SharePoint Shepherd’s Ultimate Guide for End Users is the single tool you need to help your users be effective, reduce your help desk calls, and improve adoption in SharePoint on premises, SharePoint Online, Office 365, or a private cloud. The SharePoint Shepherd’s Guide: Office 365 is now available! You can only get this exclusive content with the Ultimate Guide! Most organizations struggle finding a way to help their users become more effective with SharePoint. They might be spending a great deal of money implementing SharePoint, only to be left with frustrated users and increasing support calls. Not only does the Shepherd’s Ultimate Guide leverage research on how people learn and expertise in instructional design, it also provides the best materials for every version of SharePoint. The SharePoint Shepherd’s Ultimate Guide is a set of 250 how-to, step-by-step instructions for the tasks that users need to do the most across every version of SharePoint. Each task can be found through SharePoint navigation or via SharePoint search, and each task’s instructions are straightforward and to the point. Each instructional task is also accompanied by a screen-cast video to guide the user through the steps. Now, when an organization migrates to a new version of SharePoint, your Shepherd’s Guide migrates with you. Featuring the state-of-the-art ability to switch between versions at the click of a button, the Shepherd’s Ultimate Guide contains the tips and tricks, from the newest SharePoint installments to the oldest. In so many organizations nowadays, when budgets get stretched thin, training and help desks are often among the first to suffer. The Shepherd’s Ultimate Guide will decimate your training costs by providing the resources that your users need as soon as they need it. Based on Malcolm Knowles’ work on adult learning, your organization will spend less than it would on instructor-led training and even train your users better. If you could cut your help desk calls and support costs by over 30% by deploying a tool that helps your users understand SharePoint better, wouldn’t you take advantage of that opportunity? Our customers see these benefits every day. Experience: The Shepherd’s Ultimate Guide is authored by Robert Bogue, a fifteen-year Microsoft MVP with 25 years of instructional design experience. With author credit on over 26 books and technical and instructional design experience on over 100 more, the wealth of knowledge he brings to the Guide is unparalleled. Customizable: When your organization is stuck with a cookie-cutter solution, it can be frustrating when the help you get doesn’t look the same as the help you need. The Shepherd’s Ultimate Guide eliminates that frustration. Because the tasks come in an easy to use publishing page format, you can add tips, tricks, and policies specific to your organization, swap out screenshots to match your site’s custom branding, and even use SharePoint’s out-of-the-box security controls to restrict the guidance your users don’t need. Versatile: This Ultimate Guide for End Users gives your users the help they need in a way they understand. Whether you’re on SharePoint 2007, rolling out an upgrade to SharePoint Online, or work with groups that use Office 365, your users will be able to get their information in a way that doesn’t involve translating terminology used in one version of SharePoint to another. When your organization decides to migrate, your Guide will migrate with you – switching between one version’s Guide to the next is the click of a mouse away. Subscriptions are available for a few dollars to a few cents per user per year based on the organizations size. Fill out the form below to get more information. Doing something in one SharePoint version is sometimes tricky – buttons move or disappear altogether, the user interface looks different… Does this feature even exist in this version? Thankfully, the SharePoint Shepherd’s Guide has your users covered. Doing the same task in a different version is as simple as a click of a mouse. The steps will look different, but the goal is the same. Please contact us for more information or questions.